Part 1 introduces message-oriented middleware and the WebSphere® MQ product. It explains how messaging technologies are implemented in WebSphere MQ and shows how to get started with configuring a WebSphere MQ environment. This part briefly lists the new features of WebSphere MQ V7.1 and V7.5. Part 2 introduces the enhancements to WebSphere MQ in Version 7 Release 1. It provides a description of the new features, their business value, and usage examples. It describes enhancements to WebSphere MQ for multiplatforms and z/OS®. Examples of features that are discussed in this part include multiple installation support for multiplatforms, enhanced security with channel authentication records, enhanced clustering, improved availability and scalability on z/OS, and more. Part 3 introduces the enhancements to WebSphere MQ in Version 7 Release 5 for multiplatforms. It provides a description of the new features, their business value, and usage examples. Examples of enhancements that are discussed in this part include new installation options, such as the bundling of WebSphere MQ Advanced Message Security and WebSphere MQ Managed File Transfer. Part 4 contains practical scenarios that demonstrate how the new features and enhancements work and how to use them. In summary, the introduction gives a broad understanding of messaging technologies and WebSphere MQ. It helps you understand the business value of WebSphere MQ. It provides introductory information to help you get started with WebSphere MQ. No previous knowledge of the product and messaging technologies is assumed. 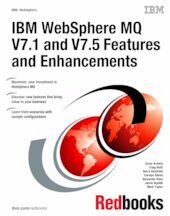 The remaining parts of this book discuss enhancements to previous versions of WebSphere MQ. The information helps you understand the benefits of upgrading to WebSphere MQ V7.1 and V7.5 and how to implement the new functions. Knowledge of WebSphere MQ V7.0 and earlier versions is assumed. This book provides details about IBM WebSphere MQ product features and enhancements that are required for individuals and organizations to make informed application and design decisions prior to implementing a WebSphere MQ infrastructure or begin development of a WebSphere MQ application. This publication is intended to be of use to a wide-ranging audience.